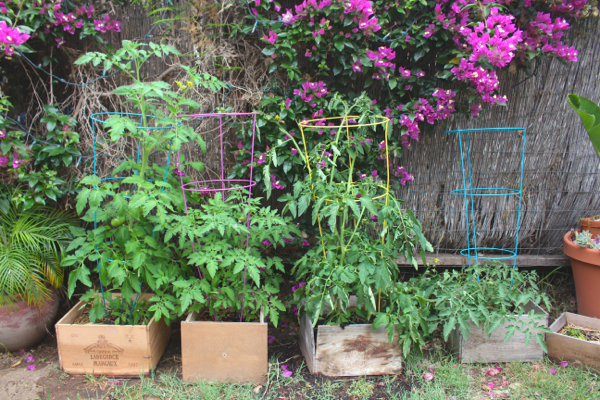 Welcome To My 2015 Urban Garden! Plus, Some Real Life Real Talk. It’s already July. HOW DID THAT HAPPEN?! 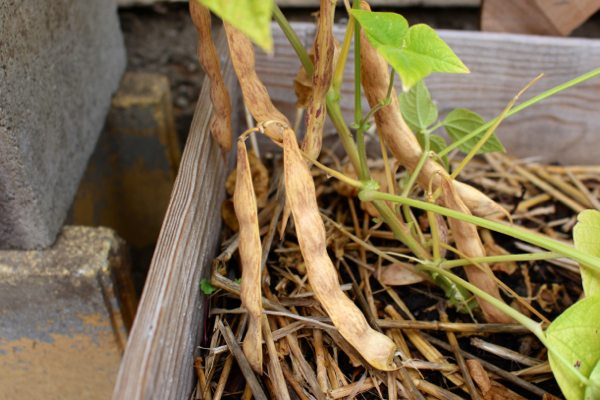 It’s already July and my garden is in full-swing, so I figured it’s about time do a little walk-through, no? But also, I wanted to give y’all a little life update. In my last Pictures Of Things + Le Love List, I mentioned that I was experiencing a lot of change right now. Which is true – there is so much change happening that sometimes it feels like my head is spinning round and round! And one of the biggest things, one of the best and saddest and most exciting and also sort of heartbreaking things, is that I’m moving . . .
. . . next door. Beautiful brussels sprouts over-summering in the shade. Regular readers may remember that for the past year and a half, Jeremy and I have been living side-by-side in a “Frida & Diego”-style double-house-compound, which we call Los Nidos. And side-by-side living is the best kind of living, if you ask me. It’s been such a blessing. But, well, times is tough ’round here. And Harley’s recent hospitalization was a final straw in a pile of straws that was very, very over-final. And I know I don’t talk about my financial situation much here on the blog, but as I’m sure you can guess — I’m not like, rolling in the dough. You’re shocked, I know! But seriously, I’m a graduate student living primarily on grants and TA stipends, and Jeremy built (and continues to build) a small business entirely out of credit. So yeah, things are tight. I’m not complaining, of course — just trying to keep it real here. Authenticity, always. I think it’s so important for bloggers, especially “lifestyle bloggers,” which I guess is what you’d call me, to be honest about their lives. Their real lives, behind the pretty facade. Because I work really, really hard to create a beautiful life, a happy life, a life that is uniquely mine. And the truth is that I don’t always have a lot to work with . . . but that’s okay by me. I am happy with all I have. It feels like a whole lot. But with that said, we’ve decided to downsize. To consolidate. I’ll be subletting my wee little cottage, and Waits and I will be moving in with Jeremy. So far it’s been really fun combing our households! And Waits has been such a sweetheart about the whole thing. He’s all smiles. 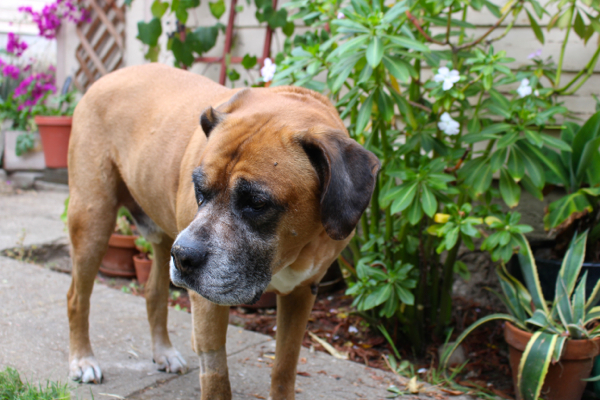 This old man, feeling much better these days, and out for a garden walk. 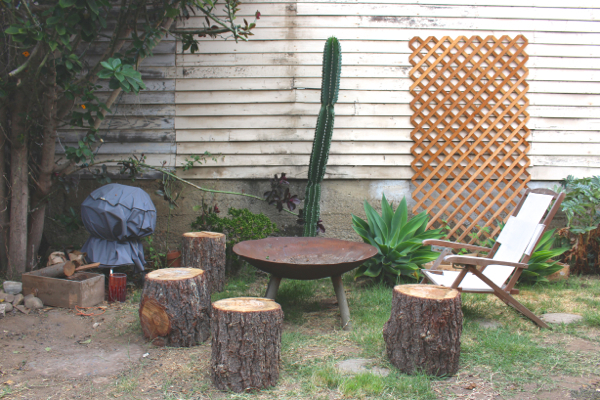 So Jeremy and I spent this past weekend moving all the outdoors stuff. 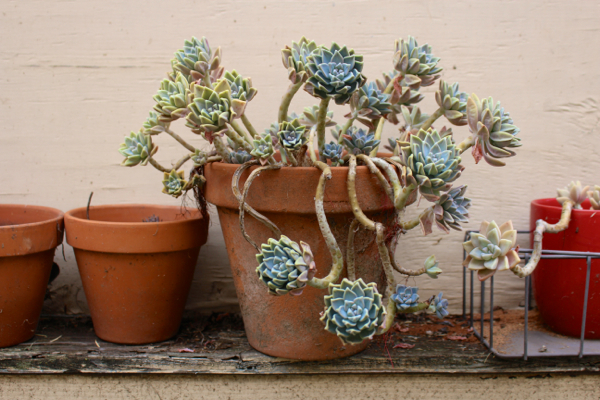 Luckily I always garden in pots and planters (I don’t trust the soil around these 100-year-old houses), so it was relatively easy to move my entire garden — in all it’s full-swing glory — from my yard over to his. And it all fit in quite nicely, I think. Nicer than I worried it would. Aahhh, my little garden. 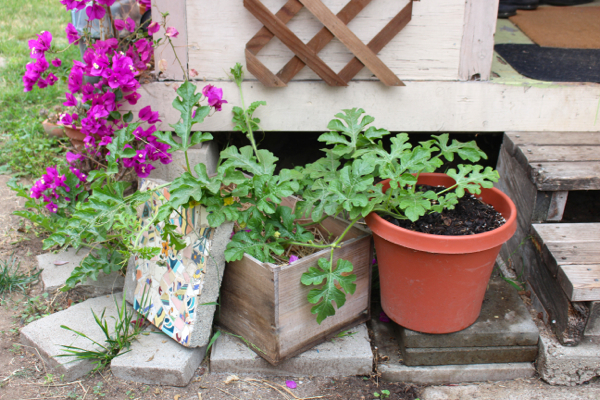 All repurposed pots and up-cycled wine box planters. 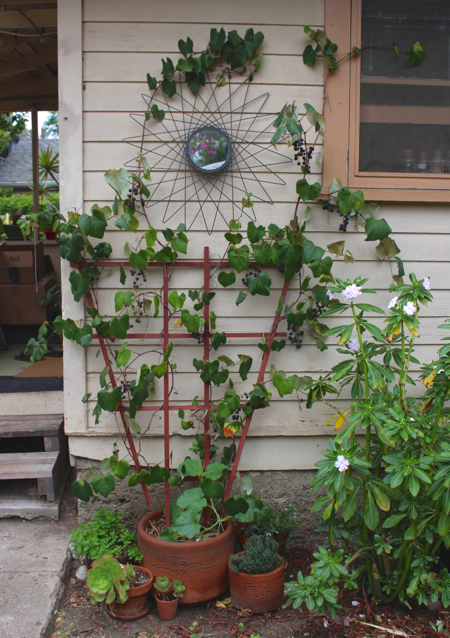 With scavenged trellis and baking twine, it’s got hand-me-down charm and broken china beauty. 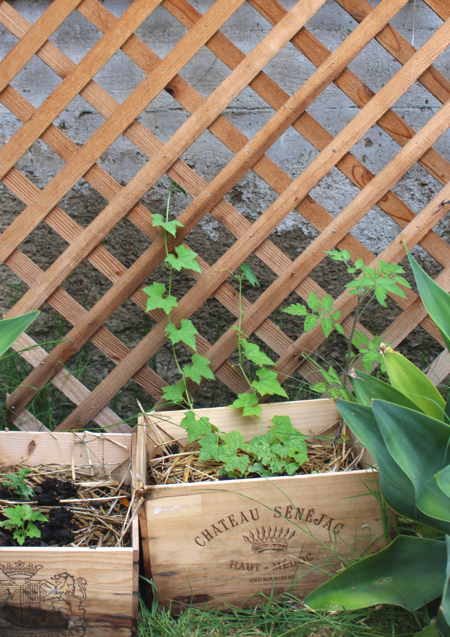 I hate buying anything new at the garden supply center, and much prefer to piece together my garden from other people’s discarded treasures (I once used an old mattress frame to trellis my snow peas), so my garden tends to take on a certain “adventure playground” aesthetic. Waits’s little play house fit nicely in Jeremy’s side yard, essentially just exactly on the other side of the fence from where it sat in my yard. 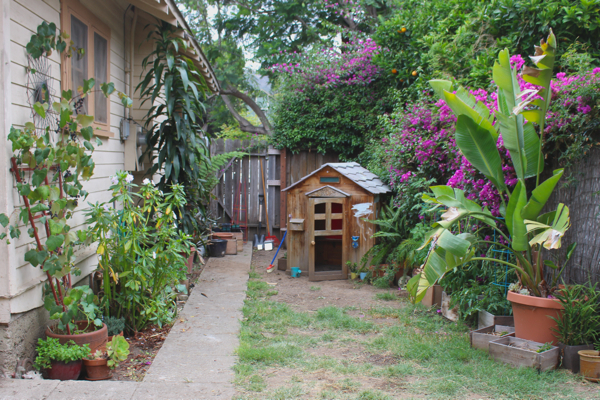 Our compost bins are behind the play house, along with the garden tools and extra potting supplies. 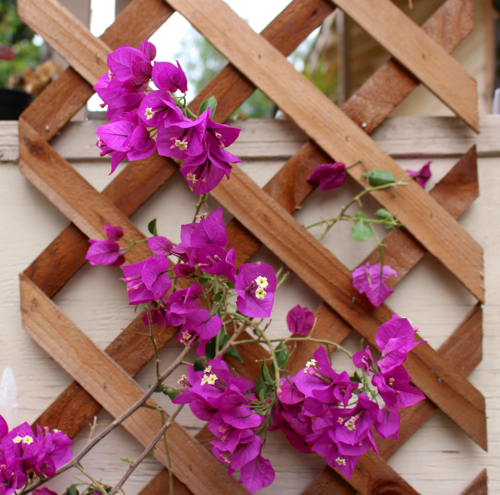 You can see my old orange tree overhanging the beautiful blooming bougainvillea vines along the fence. Grapes! A little worse for wear after their move, but overall doing okay alongside the back porch. And I’ve got edible and medicinal herbs all around the base, for easy access near the back door. And on the other side of the porch steps — watermelon! I’ve had the most miserable luck with watermelon over the years, but this time my plant is HAPPY. 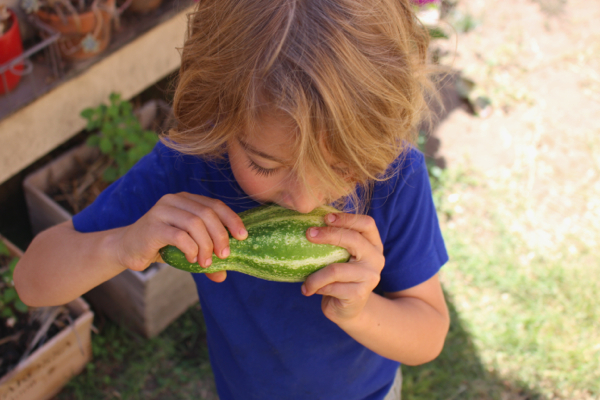 Cross your fingers for me, ’cause it would be soooo amazing to get a homegrown melon! My luffas are finally starting to take off. I saved seeds after last year’s success and was so excited to plant them again. But this spring they popped up . . . and then stopped. For months they’ve stayed the same size, no matter what I do to try and coax them into growth. Finally this pair took off . . . hopefully the rest will follow suit soon! 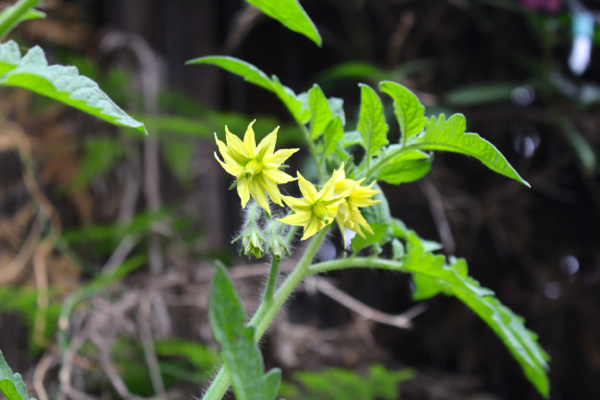 My tomatoes, on the other hand, are happy little campers. Stinging nettles for my mineral-rich infusions. Around the other side, more plants, plus Waits’s new “dig hole”. 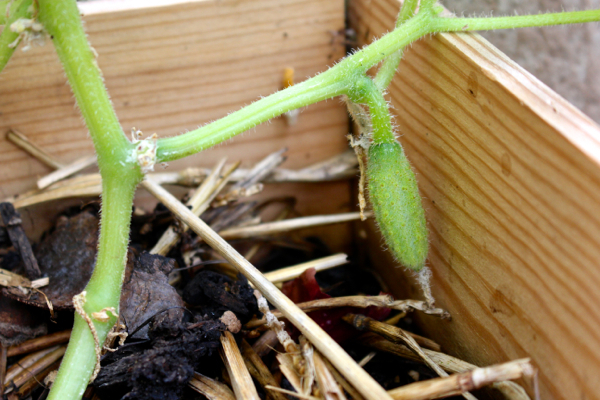 After a very rough start (the birds kept digging up and stealing my seeds and sprouts), my cucumbers are finally flourishing. This is the beginning of a passion fruit vine! I have two of these, and even though they won’t give me fruit until next year, I’m still so excited by them. Homegrown passion fruit!! And my goji berry bush is OFF THE HOOK this year. Apparently goji like to be hacked to hell. I pruned it back so far last year, I was sure I’d killed it. But then in spring it came roaring back, bigger and healthier than ever. So okay! 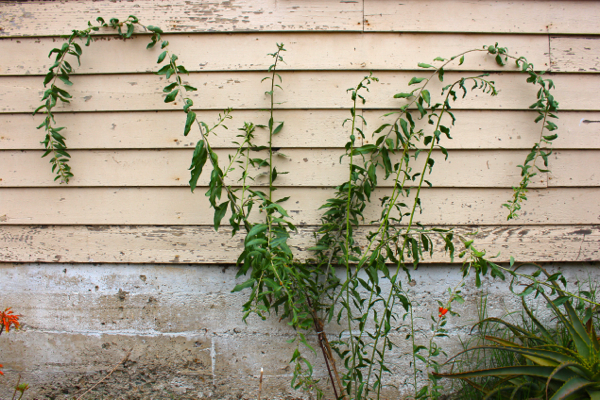 –> Prune your goji! And finally, my beans! 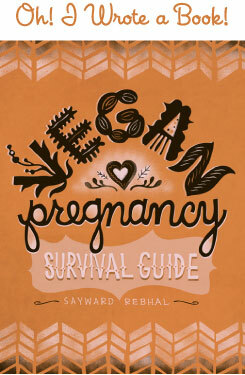 I’ve really spent the past few years exploring the idea of growing my own vegan protein. I’m still in the experimental phase, but I do hope that someday I’ll be able to produce a goodly portion of my own local, plant-based proteins. 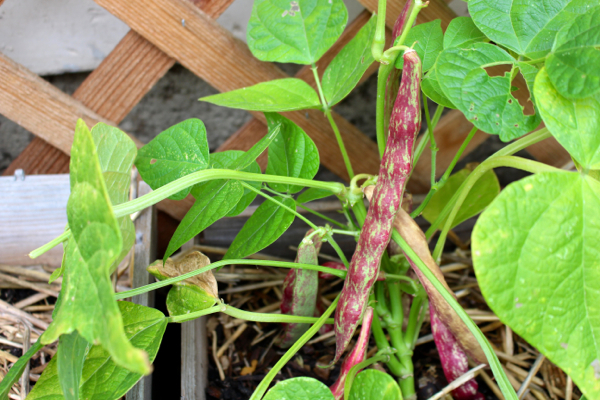 This year I’m growing pinto beans and a speckled pink Mexican pinto-style bean. They haven’t trellised as well as I expected, but it’s better than last year! The beans when they’re fresh. And when they’re drying on the vine. And that’s not even everything — I also have two dragon fruit plants, three wonderberry bushes, a whole hot pepper garden, the basil of course, and many more herbs as well. Plus the potted lemon tree. 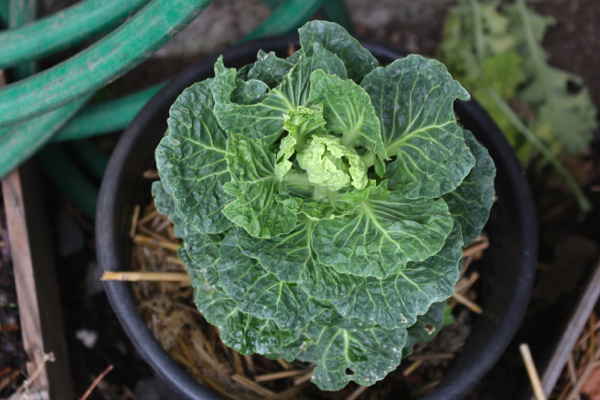 Plus the kale and chard. And I’m sure there’s more I’m forgetting! Needless to say, I pack a lot of food inside my tiny urban homestead. It’s such a labor of love and I have so, so much fun with it. 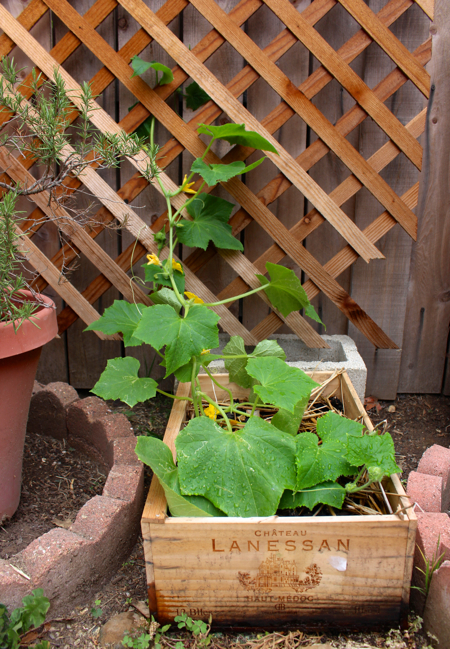 California is in a drought, so I’ve forgone all my flower-growing for the moment. 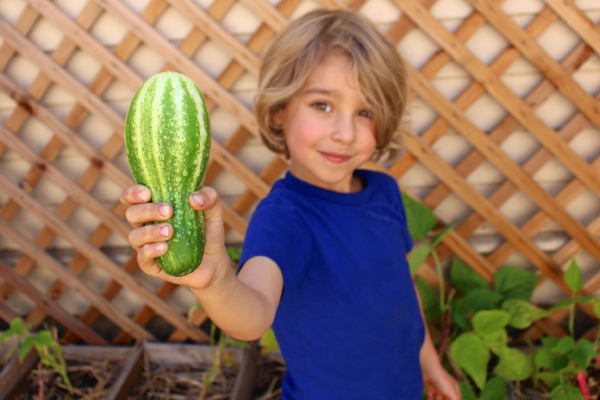 But growing food at home is such an eco-friendly, water-saving practice. I do it because I love it, but it sure does feel good to know I’m making an environmental impact as well. Okay! Now it’s your turn. 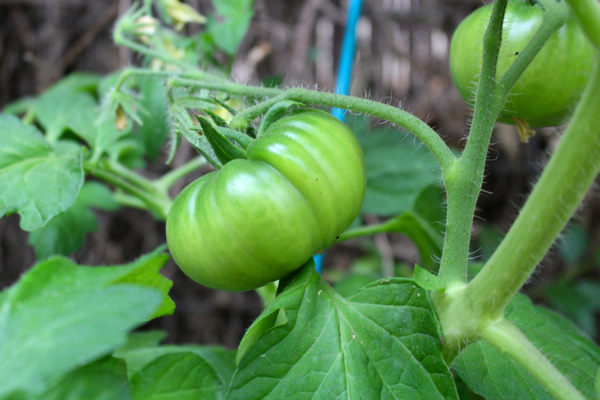 I want to know what you’re growing this year, and if you’ve blogged about your garden or posted pictures somewhere, I’d LOVE to see it! So please please share in the comments below, so we can all revel in the summer glory together! 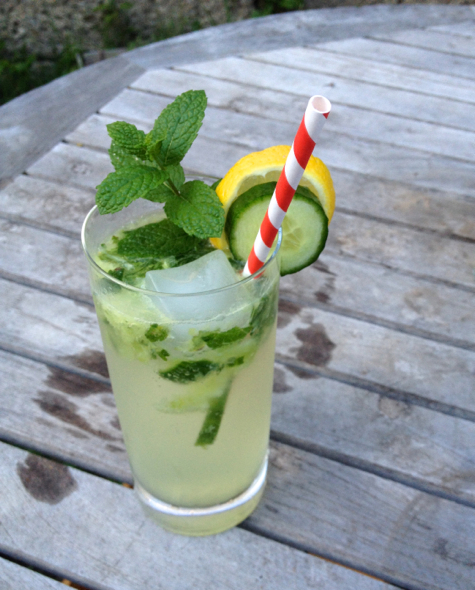 From garden to glass: cucumber mint mojito. I’m sooooo glad Harley is on the mend! My senior kitty has been having a good week also, so double yay! I have no garden of my own, I just moved back to Seattle, WA. I am going to be picking sooo many wild blackberries in two weeks or so when they are ripe at my favorite place ever, Magnuson Park! I love stinging nettle iced tea! Congratulations on your move, and I love the realness!! As a financially-challenged PhD student, I really appreciate your authenticity on this subject. It’s not something I’d wish on anyone, but it helps when others are open and honest about these things. As much as I loved your Frida-Diego setup, I wish you, Waits, Jeremy and Harley a very happy life together in your new home! The garden looks great! Thanks as always for being so authentic–I’ve been running into some of the same grad student related lifestyle conditions myself. Sort of part of the experience I guess? Unfortunately, there’s no garden for me at my little flat in Florida, but I’ve been planning to add a few window boxes/potted plants outside my door. I’m hoping my mother will have something to share when I’m up enjoying her garden next week. I’m always living vicariously through others’ plants! Best of luck to you and the fellas in your new living situation! Wishing you all the best! Harley up and about! My parents neighbor has a huge goji berry bush, giving us carte blanche to pick it all. I work away from home all summer so I skip planting vegetables cause I can’t care for them, one day I’ll at least do herbs. 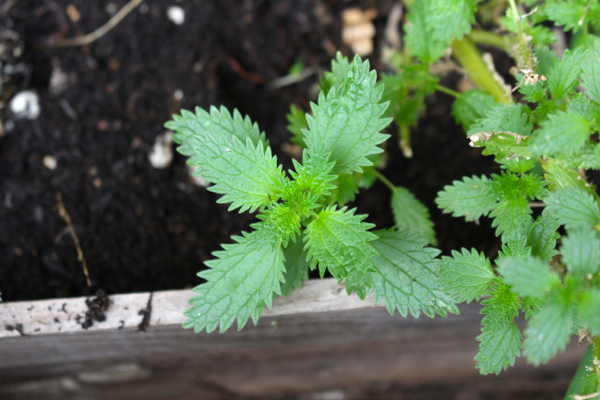 I love that you’re growing your own nettle! A friend just gave me a little purslane plant I’m nursing back to health on my desk. I’ll plant it when I get home this fall. Good point about not trusting the old soil. Will you continue calling it Los Nidos? zucchini, summer squash, cucs, salad greens, peas, stawberries, okra, turnips, beets, jalepeno, kale, chard, tomatoes, cabbage, celery, horseradish, and a plethora of culinary & medicinal herbs. We’re fortunate to have summers off (yay for teaching!) and have a garden that is in full sun all day! 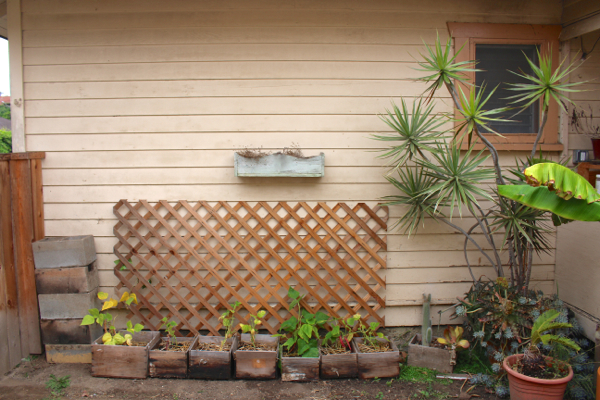 Loved seeing your garden–good luck with the move! A Goji berry bush?!!? How did you do that? I need to know! I thought your side-by-side digs were just about the best thing ever so it makes me sad that Los Nidos will be changing…but I’m sure all will turn out just fine. There’s always a silver lining! Side note – I am beyond green with envy that you have a passion fruit plant starting!!! YUM!!!! Thanks for sharing your garden. You have inspired me to give mine some extra love when I get home tonight. So happy to see Harley feeling better and roaming about. Still sending him good juju! ALSO your garden looks beautiful! 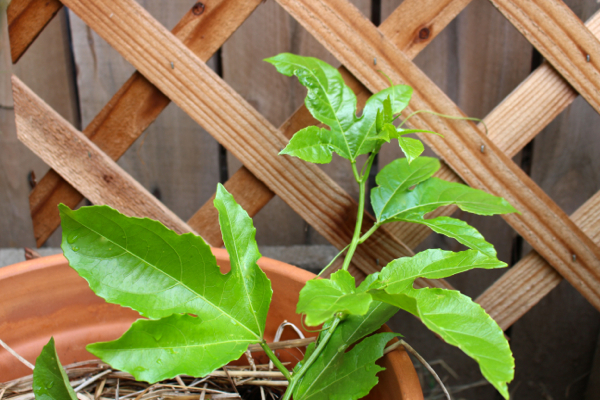 We planted a passion fruit vine here too, just about a year ago, and now it reaches the roof of our two story house! We still don’t get a whole lotta fruit, but its pretty astounding to behold regardless. ALSO, thanks for your comment about soil and 100-year-old houses… how did I not even think of that?!? I just bought a 95 year old house last month (!!) and was getting super duper excited to plant things actually in the ground (we have been lifelong renters til this point), but I guess the veggies and herbs should probably stay in pots of guaranteed lead free soil! My boyfriend and I are actually pretty terrible gardeners, but we keep trying and it’s fun. Right now the only edibles we have are basil (which is actually doing awesome), rosemary and parsley which are kind of struggling for some reason, and a blackberry plant that has given us like six berries so far (SO EXCITING!!) but seems to be struggling a bit as well the last couple weeks. I also have a hanging flower basket I got for my birthday that is basically dead (I feel like only I could kill something like this), some kind of pretty orange-red daisy-looking flowers I bought at the farmers market on a whim (still doing well! ), and my boyfriend has a Venus flytrap and some other carnivorous plant (he also bought these on a whim, from Home Depot, while exchanging a propane tank. LOL). The gardening thing I’m super excited about right now is that I’ve never in my life had even the slightest interest in ornamental/non-edible gardening, but when I bought my house it came with some pretty cute landscaping–like “tattered/weedy, but generally nicely laid out with a variety of plants” beds (including some lavender! and a crepe myrtle! )–in the front, and a totally overgrown bed in the back which has what I think are zinnias (? based on two friends’ guesses and the fact that they reseed so that would make sense that they popped up spontaneously even though the house had been vacant for six months) and they are SO pretty!!!! So for some reason now I’m super duper excited about taking care of these plants and adding more flowers next year. I pulled out all the crazy weeds around the zinnias last night and it was weirdly meditative and awesome. It’s bittersweet for the move! Lovely for harmony, but sad in other respects, too :) Best of luck with the transition! As for gardening this year, we’ve got sweet peas (for my little girl who lovingly picked the seeds out herself this year), tulips and our usual irises in the front. The back is one solitary strawberry, spinach, lettuce, pumpkins, carrots, what I think is cucumbers (don’t even remember planting them), swiss chard, corn, sunflowers and one pea plant that has a whopping 3 pods on it (although I am beyond excited, as the peas are usually the first food for birds to attack in the garden). I ABSOLUTELY appreciate your authenticity and keepin’ it real!! 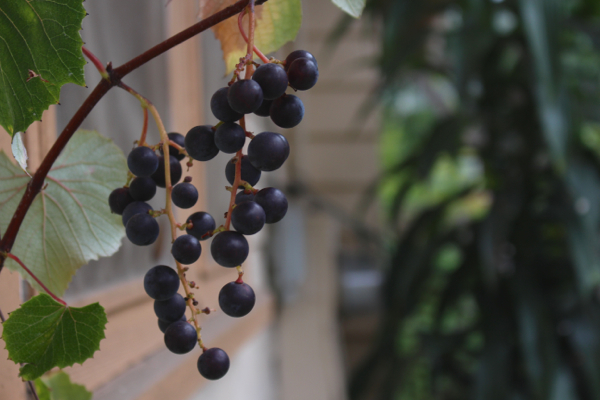 Home grown grapes AND Gojis?! Yum!! I’ll need to add that to my garden wish list. I think I’m going to have to do a garden update on my blog now. These are my absolute favorite posts that you do. I LOVE seeing what other people grow! I’m bummed about your house situation, since I know how much you love that house, but I’m a big believer in everything happening for a reason. Hopefully, this little hiccup is going to lead to amazing things. Like your goji plant, sometime cutting back leads to unbelievable growth. Your authenticity is what I appreciate most of all about this blog. And I’m so happy to see Harley is doing better. He’s such a handsome fella, and he brightens my day when I see him. lady, congrats, and way to keep it real. one foot in front of the other – you still make it look like you are handling it with utmost optimism and grace. this was a great post. best of luck! 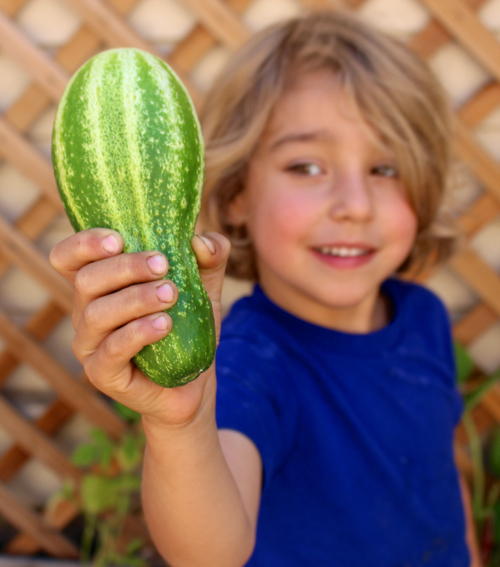 OOOHHHH, I have fresh cucumbers in my garden, AND mint! What did you do for the mojito? So easy! Just muddled a few pieces of cucumber with a few torn up sprigs of mint in the bottom of a large high ball glass. Added a squirt of agave, ice cubes, juice of 1 lime, and 2 oz of rum. Topped with club soda, stirred, and served! Amazingly refreshing and light on the liquor, so it’s easy drinking. So yummy! Seattle blackberry picking! I have MANY fond memories. The pies, oh the pies! Yes, Harley is doing SO much better! It warms my heart, he’s really getting back to his old self and it’s so wonderful to see. 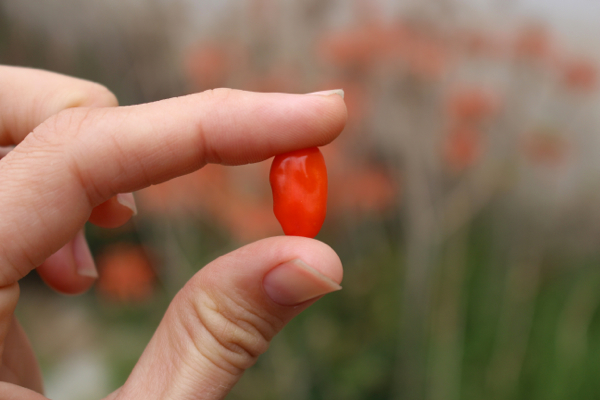 That’s so awesome about your goji poaching — very lucky! They taste so different fresh, I really love how delicate the flavor is. And you should try herbs! 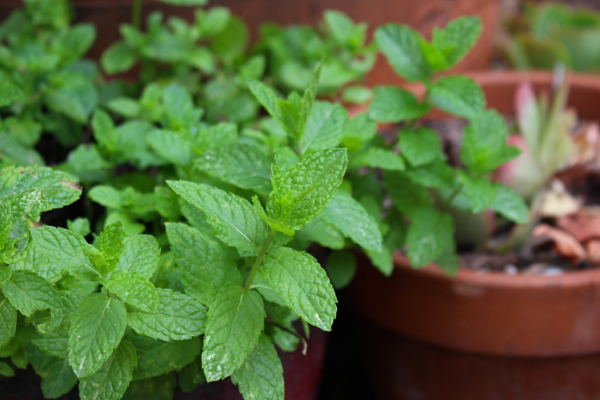 Herbs in pots are easy but they can add SO much to your life – in juices (my fave), in dressings, in cocktails/mocktails, infusions . . . so many options! We haven’t discussed the name or how it might change. El Nido perhaps? . . .
Krysta! I actually got it in Portland, funnily enough. At this festival in the schoolyard across from the vegan mini mall (don’t remember what it was called). But I bet if you call around to Portland nurseries, one of them would have it. I’ve seen it in nurseries around SB and we’re not nearly as progressive. Or, I was hopping around on my favorite seed supplier today, Baker Creek Seeds, and saw they are selling goji seeds. You could start them from scratch! Thanks Kristin! And yes, I am soooo excited about the passion fruit plant! 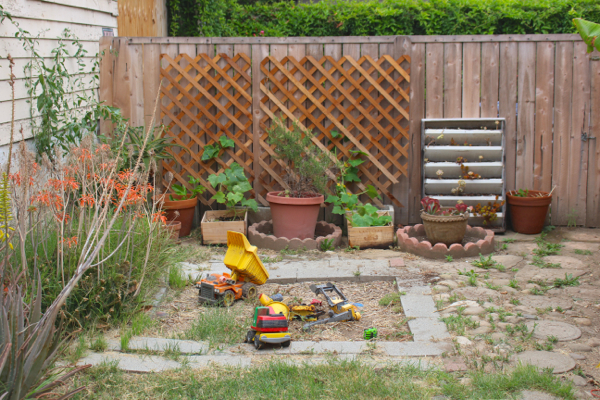 We used to have a GIANT vine/shade area at our last preschool location, and it was amazing. You’d just be sitting there under the canopy relaxing, and could just reach up and pluck a passion fruit! They were so abundant and so delicious. I can’t *wait* till my vine is producing! My garden is busting this year! I’ve got baby kale and leaf lettuces, sorrel, cucumbers, beans, tomatoes, basil, shiso, nasturtiums, oregano, mint, chard, collard, chives, sunflowers, mexican sunflowers, dahlias, datura, and wild feverfew!